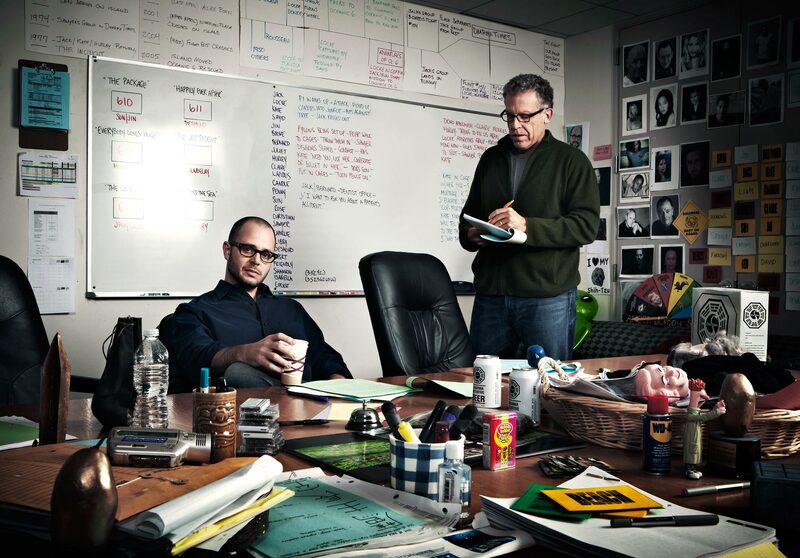 The photo features the office of LOST executive producers/showrunners Damon Lindelof and Carlton Cuse from WiReD Magazine’s latest epic article on the television series’ final season. Absolutely. I assume that as a physicist, you say, “Force equals mass times acceleration,” and you can explain why. But when you spend time with a 3-year-old, you quickly find out that one question just begets another—there’s a “why” in the wake of every “why”—and the only way to end the conversation is to say, “Oh look, a Chuck E. Cheese!” The show is doing its best to say, “Oh look, Chuck E. Cheese!” For example, we’ve now given the viewers as much as we’re willing to say about the numbers, and we’re moving on. The characters are going to ask “What is the island”, and “Why are we here”, but more importantly, “How is it relevant to me.” They’re not sitting around in smoking jackets talking about the theoretical notions that we are, as audience members. Click on the image above to see it in full. There are a lot of interesting things going on in the background. This is how they organize the chaos.